Veterans Day 2017 Movie from Misericordia University on Vimeo. Veteran Services at Misericordia University provides a communication channel between veterans/service members, spouses, dependents and the University. Its purpose is to inform and guide students through their Misericordia experience while insuring that the appropriate support services are available. "GI Bill©" is a registered trademark of the U.S. Department of Veterans Affairs (VA). Fill out the Undergraduate Application if you are applying to college for the first time, in high school, have graduated high school four or more years ago, or are a college transfer student. There is no cost to apply using the online application system. Fill out the Graduate Application if you are seeking your advanced degree (a master's or doctorate). There is no cost to apply using the online application system. When received, submit a copy of your Certificate of Eligibility to the VA Certifying Official. The American Council on Education (ACE) recommends college credit for military training and experience. Misericordia uses ACE recommendations for awarding college credit for students with military transcripts. For a list of Majors/Minors refer to the Misericordia University website under the Academics tab or by clicking here. Currently enrolled Veterans that have stated on the admissions application that they have served or those Veterans receiving GI benefits will receive priority registration at Misericordia University. For more information contact the Registrar. For education benefits related questions, contact a Veterans Benefits Counselor at 1-888-GI-BILL-1 (1-888-442-4551). Once you have registered for classes submit a Veteran Benefits Request Form to MU’s VA Certifying Official with a copy of your current course selection schedule for the upcoming term you are requesting VA enrollment certification for. Pick up a form at the VA Certifying Official’s office located in Mercy Hall, first floor room 114. The VBRF is your authorization to submit enrollment to the VA and your commitment to pay any charges owed to the school that are not covered by VA benefits. Misericordia University participates in the Yellow Ribbon GI Education Enhancement Program. The Yellow Ribbon program provides matching funds from the Department of Veterans Affairs to supplement the Post-9/11 GI Bill©. GI Bill© BenefitsPost-9/11 GI Bill© recipients who qualify at the 100% benefit level are eligible for the Yellow Ribbon program. Please visit the VA Yellow Ribbon Program for more program-specific eligibility information. More information available regarding the Yellow Ribbon Program at Misericordia. WAVE is the Web Automated Verification of Enrollment. Applies to Veterans Receiving Chapter 30, 1606, 1607 and VRAP MGIB Benefits. Submit monthly verification of enrollment. Those receiving the Post-9/11 GI Bill© do not have to verify their attendance through WAVE. Verify your attendance on the last calendar day of each month you are attending classes. Veterans can check the status of their record, and report changes to their enrollment directly to VA.
Mortgage protection insurance that can help families of severely disabled Service members or Veterans pay off the home mortgage in the event of their death. A great place to begin your application process and obtain information on VA programs is by going to the U.S. Department of Veterans Affairs website. GoArmyEd is for eligible Active Duty, National Guard and Army Reserve Soldiers to request Tuition Assistance (TA) online. GoArmyEd assists with managing your education records including classes, testing, and on-duty classes. The AF Portal Login is the Air Force's online process for airmen to request Tuition Assistance. The Air Forces' "Virtual Education Center" Online Tuition Assistance Request forms may be found in the portal. Misericordia University offers free tutoring for students in the Student Success Center. Students using federal GI Bills© can receive a supplemental payment for approved private tutors. The veteran/servicemember must be currently enrolled and at least half time. Find more information at the U.S. Department of Veterans Affairs webpage on tutorial assistance. CWV monitors and coordinates VA's administration of health care, benefits services and programs for women veterans. The Admissions Office provides assistance to students and student veterans/service members navigate and succeed with academic resources and transition services. Students at Misericordia University are assigned an advisor once accepted into the university. 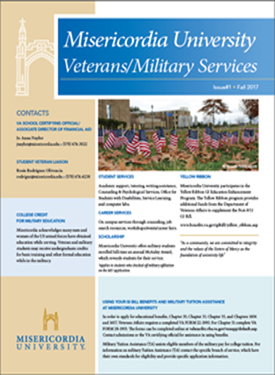 The Academic Advisors can help Veteran students register for classes. Advisors assist students meet university requirements to reach their educational and career goals. Campus Ministry at Misericordia University serves the Mission of the University by making visible and effective their Mercy Charisms and Catholic Tradition. They seek to respond to the Critical Concerns of the Sisters of Mercy through advocacy, education and action. Campus Ministry is located in the Banks Student Life Center. The Insalaco Center for Career Development provides career-planning services that prepare students for successful transition from college to career. They provide individual career counseling, resume and cover letter development, career assessment/major choice using MBTI and Strong Interest Inventory, internship advising and resource, graduate school advising and resources, career and internship fairs, networking fairs, interview preparation, part-time job opportunities among a broad variety of other services. The Insalaco Center for Career Development is located on the first floor of McAuley Hall. The CAPS Center offers support and counseling services appropriate to the students’ needs. Our services are confidential and available at no charge for a variety of topics, such as adjusting to college, anxiety, depression, or relationship concerns. A counselor is also on call 24 hours a day for emergency services. Please call the CAPS Center at 570-674-6408, or simply drop by our office during business hours to schedule an appointment. The CAPS Center is located on the lower level of McGowan Hall. The Expressway program is formatted to meet the needs of working adult students. Students can earn a bachelor's degree in as little as 2 1/2 years. Students attend classes 1 evening per week, four hours per class, in 5 week sessions - or in 7 1/2 week online sessions. Students can chose to complete the entire degree online if that is a more convenient option. The tuition for Expressway students is discounted and it is lower price per credit. Financial Aid is available for qualifying students. Students have up to 10 years to complete their bachelor's degree. The Student Success Center is an academic resource for all Misericordia students who want to improve their academic skills and strategies. The SSC provides assistance through tutoring and other resources to help you become more confident and successful in your coursework. The SSC is located on the lower level of Alumnae/McGowan Hall. The Department of Veterans Affairs defines a School Certifying Official (SCO) as the individual assigned the authority of completing all paperwork necessary to certify the enrollment and changes in enrollment for students eligible for VA educational benefits at their college or university. The school certifying official does not determine eligibility for benefits nor do they have access to any student’s Department of Defense VA records.